I particularly love these two images together because it reflects the identity of the designers who created them. The dress on the right is a wonderful example for the legacy of the House of Dior, and how deeply it influenced John Galliano. Throughout his career at the house he frequently looked back to its history and the early collections created by Christian Dior himself. On the other hand, Clair McCardell was a modern designer in every respect, always looking ahead. Her designs still look contemporary today. In my point of view she is one of the most important American designers; her modern taste, her effortless chic, and her simple and practical clothes represent the essence of American style. 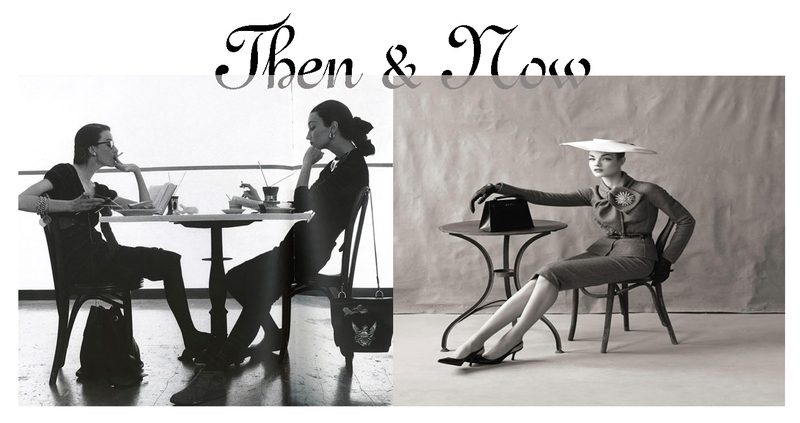 This entry was posted in Then&Now and tagged 1950s fashion, Clair McCardell, Dior, Dorian Leigh, Evelyn Tripp, Fashion Photography, House of Dior, Irving Penn, John Galliano, Vogue. Bookmark the permalink.